A new randomized, double-blind, placebo-controlled trial has found bright light therapy to be a powerful intervention that could provide an alternative to medication for people with “bipolar depression.” Two-thirds of the people receiving the light therapy improved, compared with one-fifth of those who took only medication. The research was led by Dorothy Sit at Northwestern University and published in the American Journal of Psychiatry. The study included people who had a diagnosis of either bipolar I or bipolar II disorder, but who were not currently meeting criteria for a manic or hypomanic episode. All participants were taking “antimanic” medication, also known as “mood stabilizers” (e.g. lithium). Many (78.3%) of the participants were also taking antidepressant medications, and the researchers made sure that both the control group and the intervention group had similar numbers of people taking these drugs. All participants also met criteria for continuing depression, despite their current medication regimen. One group of 23 participants was exposed to 7000-lux bright white light daily, between noon and 2:30 pm. They initially began at 15 minutes of light use, then gradually increased to the “target dose” of 60 minutes per day at week 4. The other group received a placebo light intervention that was described as “50-lux dim red” light. The difference in improvement is startling. 68.2% of people who received the bright light intervention no longer met criteria for depression (what researchers refer to as “remission”), compared with only 22.2% who received a placebo light intervention. This difference was not due simply to an improvement in sleep quality, as sleep was observed to improve equally for both groups. There was no difference in side effects between the two groups, indicating that light therapy did not create any additional adverse events. No one experienced a hypomanic or manic episode. 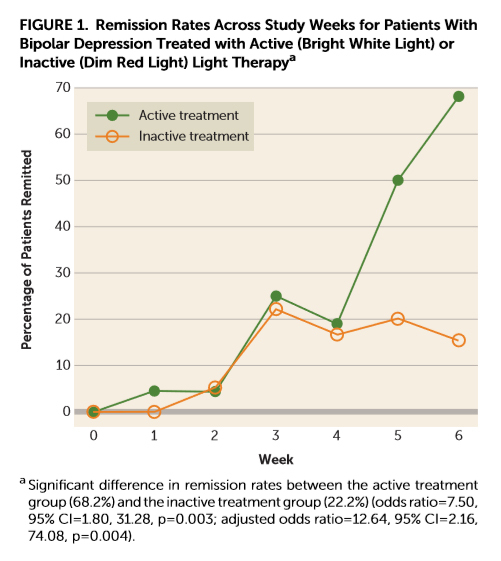 The improvement in depressive symptoms appeared to occur between weeks 4-6 for most participants, which the researchers theorize is due to reaching the 60-minute per day “dose” of light at week 4 (see graph below). Particularly surprising is that, despite most participants being on antidepressant medications, only one-fifth of those who did not receive the light therapy experienced remission of their depression. As noted by the researchers themselves, the antidepressant medications did not seem particularly effective in this case. They further write that antidepressant medication is often not recommended for this particular population, as it could trigger manic symptoms. Thus, given the lack of effectiveness of antidepressants, and their associated risks, bright light therapy could be positioned as an effective non-medication option for improving mood for people with the bipolar disorder diagnosis. 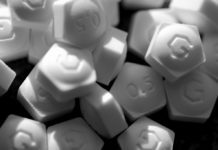 The researchers also suggest that this could be an intervention suitable for pregnant women, who may not wish to risk taking psychopharmaceuticals. Previous articleYour Pharmacist is Tattling On You! I just read the title of this article and thought that bright light therapy might also be more effective in treating Santa Claus’s depression, the Easter Bunny’s ADHD, and the Tooth Fairy’s Schizophrenia. Good grief people. There’s no such thing as “bipolar disorder.” It’s a figment of the psychiatric imagination, just like every other bit of the myth of “mental illness.” There’s no such thing as an “antidepressant” either. It’s simply sickening to considering how much money is being wasted on “studies” such as these. Nietzsche mocked the modern scholar who would become an expert on the brain of a leech, but he could never have foreseen the extent of the stupidity of the modern psychiatric researcher. Studies on “psychiatric” illnesses are frequently a waste of time, because the alleged diagnoses are simply descriptions of groups of behaviors that may or may not be linked. Within these “diagnostic” groups are individuals suffering from a heterogeneous bunch of conditions; it would be lucky to determine anything real about all the groups within such “diagnostic” categories. Interesting enough, light therapy for psych patients has been around for about 40 years, but back then it was treated by the orthodox as a sort of equivalent to crystal gazing or having the witch doctor dancing around the fire, chanting and tossing mineral salts into the flames to get multi-colored flashes. Translation: Some doctors don’t know what they’re doing, and in the realm of quasi-medicine, if you happen to be a practitioner of such, that can be a big plus. How best treat an imaginary disease? With an imaginary cure, of course. It is pretty sad, these “mental health professionals” are still pretending the DSM disorders are real diseases, despite the fact all the DSM disorders were debunked as “invalid” by the head of NIMH five years ago. Goes to show how insanely delusional, and seemingly “incurable,” today’s DSM believing “mental health professionals” really are. But at least he’s trying to educate the “mental health professionals” about the ineffectiveness of the “antidepressants.” And he did point out that the “antidepressants” are also dangerous, since they can create “mania.” I’ve met very few doctors who will actually admit to this. And, no doubt, this is a systemic problem amongst today’s medical community, since they’ve already misdiagnosed the common adverse effects of the “antidepressants” as “bipolar” in millions of people, including many children. What’s really sad is the psychiatric industry’s response to Whitaker pointing this out was to make such a DSM-IV-TR “bipolar” misdiagnosis, an acceptable iatrogenic pathway to a “bipolar” diagnosis in the DSM5. Talk about absolute corruption within today’s psychiatric leaders. I will say I do use a light box in the winters, and as a person who had the common adverse effects of an “antidepressant” (given under the guise of a “safe smoking cessation med”) misdiagnosed as “bipolar.” I have never suffered from the “depression” part of the “bipolar” misdiagnosis. I don’t know if that is because I use the light box or not, however. Since prior to the time when Emil Kraepelin separated the redeemable bipolar disorder, then manic depressive psychosis, from the imminently irretrievable schizophrenia, his dementia praecox, this kind of leap to medicalizing judgment has been the trend. Yeah, “bipolar disorder” has represented one of the stalwart pillars of the “mental illness” religion, especially with the flipped coin genetic twist. If you want to be “sick”, like the magazine, this is your big chance. Jump on board. You, too, can fight the “stigma” of any psychiatric label’s unpopularity and tendency to buck the trend. You can start by introducing yourself to your friends as “Hi. I’m Bipolar.” Should a doctor agree, there’s money in it. This is way up there with all of the Aut of the Autistic. Where, after all, culturally would we be without it? The institution has spawned it’s own variety of gallery debutante, and this disposition has a great potential for changing the world. (Not fast enough to suit me, of course.) What more can I say, but what an incredible update on ye ole chimpanzee! Back in the early ’90s, I noticed a strong correlation between the darkening of the days and the darkening of my mood. I used to journal almost daily, so it was right there in the pages, a big difference between the me that wrote in spring/summer and the me that wrote in the fall/winter was easy to discern. So I located a guy who made high-intensity full-spectrum light boxes (not easy before the internet) and bought one. Mine was 10,000 lux and I used it first thing in the mornings, for about a half-hour. The theory went like this: our circadian rhythms are primarily cued by the light we see. For some people, during the darker months when mornings are not as early or as bright, the light cue they take in visually is not strong enough to signal the brain to slack off on its melatonin production. So you boost the strength of morning light by adding the light box. Later, they came out with a “dawn simulator” version that you’d set like an alarm clock to brighten your bedroom gradually each morning. I never tried that- the light box I bought worked wonders. Yes, it is another neurotransmitter imbalance theory. But considering that the biggest risk to the “treatment” was a little bit of UV exposure (less than I experienced in the summer sun) it was easy to test this theory on myself. I slept better. I had more energy in the day. I felt more human and less like a grumpy hibernating bear. So yes, my system improves dramatically with the introduction of a strong light cue to help my body regulate its melatonin production. To me, that’s no different than drinking extra water when I’m constipated: I’m just giving my body a bit more of an essential it needs to perform basic functions better. Bingo. rawSienna, where do you stand with regards to the abolition of psychiatry and anti-psychiatry? Light therapy is not a real therapy, but a means of neutralizing the deleterious effect of artificial light by mimicking natural light. It is rather a useful technology in a society where buildings hide sunlight and artificial light is omnipresent. Light therapy, music therapy, work therapy, environmental therapy: what is part of the culture is transformed into “therapy”. That does not mean that all these things are bad, but simply that the psychiatric environment turns them into commodities. Exactly. I’d much rather have people exposing themselves to light rather than drugs, but why do they have to be “diagnosed” to do so? And what about the impact of the society that deprives its members of sufficient natural lighting? I think if you do something, possibly anything, that you expect might make you feel better, it probably will. And if you were in a study, and someone was acting even sort of half way like they were interested in how you felt, that would help you feel better. I tried a light like that once, and it didn’t seem to do anything, but I wasn’t expecting it to. What helps me is when anyone shows what I perceive to be a genuine interest in what I think or feel. I have never understood how therapists or psychiatrists hope to do anything with their cookbook methods. Yeah, really, it’s not rocket science. Listen empathetically, be interested, care, be real… don’t need to go to school for those, and in fact, no school can really teach them. What it requires is being in touch with your humanity and putting out your energy to be there for someone else. Apparently, that skill is in short supply, though! my psychiatrist asked if I was interested in light therapy…. I was and I tried using his light box for awhile..
depression….I still am searching for the cause of my breakdowns..
critical psychiatry….getting rid of the bad…he sees psychiatry as being very sick.. Mood stabilisers are not generally considered specifically ‘anti-manic’ – they are instead generally considered as exactly mood stabilisers, in that they prevent ascent into mania AND descent into depression – as well as being used to treat acute mania and depression. For some with mania it may be as you describe, for others it’s horrible and destructive and it’s far more than heightened awareness. Mood stabilisers, for all their terrible side effects have proven efficacy in reducing relapse rates to depression and mania. What is the correct mood to have? Well only the individual can really be the judge of that, but many of those I’ve worked with would be very happy to sacrifice some heightened awareness in order to never again have a manic or depressive episode. Others feel that the benefits of medication in no way make up for the side-effects. Well done! Gave me a couple of laughs! That 300 watt old school incandescent light bulb in the hardware store puts out the same color spectrum at the proper intensity.